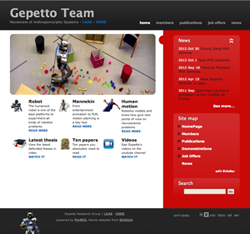 The Gepetto team aims at analyzing and generating the motion of anthropomorphic systems. Created in 2006, it became rapidly one of the world leader teams in humanoid robotics, unanimously recognized for its expertise in motion generation. The key difficulty of motion generation and control of anthropomorphic systems comes from the redundancy of their tree-like structure with respect to most positioning tasks, the natural instability of the bipedal posture, and the under-actuation of their spatial displacement. We aim at studying this problem by following an interdisciplinary approach focused on three research objects: the humanoid robot, the numerical mannequin and the human body. The research activity of Gepetto can be described in three levels: fundamental research, integration and application. The fundamental research level concerns theoretical developments related to system modeling and motion generation. Modeling is to be understood at large. It includes the mechanics of robotics systems, the mathematics of new representations and operators, and the recording and analysis of the human motion. Motion generation ranges from global trajectory planning to local movement control, both problems being considered under different kinds of constraints. These developments rely on complementary disciplines including mathematics, mechanics, automatic control, and computer sciences, but also biomechanics and movement neurosciences in collaboration with specialists of life sciences. The integration level constitutes our core competence. It consists in integrating our theoretical developments in advanced software packages that we strive to maintain and make accessible to the robotics community by using standard formats and tools. The application level concerns our contribution to different domains such as assistive robotics, industrial robotics and specifically the factory of the future, movement ergonomics in PLM, actuator design, graphic animation, human movement imitation and understanding, etc.